Synology is best known for its feature rich network storage solutions, but last year, it broke into home and SMB markets with its very first router, the RT1900ac. Under review today is the follow-up to this router with the faster and improved RT2600ac. It’s 2017 and while still early in the IoT revolution, more and more devices are talking with one another. With the connectivity needs of today’s homes, network bandwidth has been required to become both faster and wider, to keep up with the demands we’ve started to place on them. Early last year we took a look at Synology’s first foray into the home router market, with the RT1900ac. In that review, the RT1900ac provided higher than average wireless performance, but hands down, the feature that stole the show was Synology’s SRM (short for Synology Router Manager). SRM brought the best NAS user experience available to a home router, and with it, all the ease and convenience of operating within it. 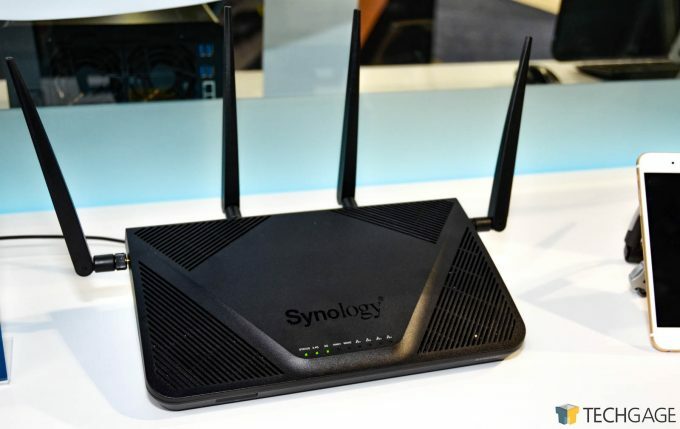 After the success of its RT1900ac, Synology upped its game by releasing the RT2600ac, the Taiwan-based company’s second router to come to market. The Qualcomm-based 4×4 MIMO RT2600ac is powered by a dual core 1.7GHz CPU. Upping the aggregate potential throughput from 1900Mbps to 2600Mbps, thanks to the Qualcomm CPU, the RT2600ac looks to be the RT1900ac’s superior in every way, but our testing be the judge of that. 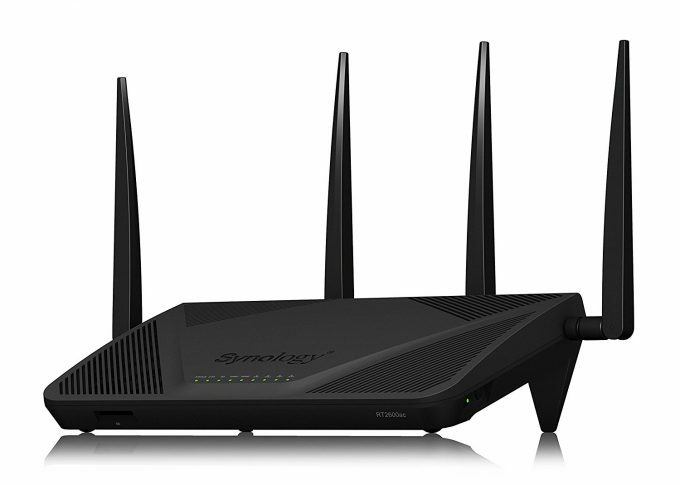 The RT2600ac, as the name implies, is a wireless AC router providing combined speeds up to 2600 Mbps. For the uninformed, this sounds like a ridiculously fast offering (being over 2 gigabits) – and for home networks it sort of is – but we must always keep in mind that the advertised speeds are theoretical. Oh, and there is some marketing addition that takes place too. Because, numbers. See, wireless AC routers are almost entirely dual band. I can’t actually think of, or find any, that don’t at least offer a simultaneous 5 GHz and 2.4 GHz radio, so any advertised speed is going to be the sum of at least two numbers. There are some that are tri-band, but that’s for another review. Concerning the RT2600ac, the 2.4 GHz band offers 800 Mbps speeds. The 5 GHz AC band offers 1730 Mbps. You add those two numbers together and you get 2530, err… 2600 Mbps. You can guess where the RT2600ac gets its name. It’s dumb, but it’s marketing, and it’s how every company brands its routers. We can’t fault Synology or any of the other manufacturers individually for how we ended up with this naming convention. For those of you that read our review of the RT1900ac, or have seen one in person, you’ll immediately notice that the RT2600ac’s stylings are somewhat similar. The RT2600ac has a matte black finish across its body, and in all four corners on the top of the router are generous amounts of ventilation to help keep the internals cool during operation. The LED lights have been moved from the front edge of the router to the top, and all but the status LED can be toggled on and off or placed on a schedule in SRM (in case you need to sleep with it in the room). To aid in cooling, the RT2600ac is elevated in the rear by a pair of legs that keep the router’s back-end about 2.5 inches off whatever surface it is placed upon. Unlike the RT1900ac, and many other routers, the legs on the RT2600ac are molded into the body and cannot be removed. Because of this, the stand that is offered with other routers on the market is no longer available with the RT2600ac. This means users are expected to place the router on a flat surface, but with a little ingenuity, it can be mounted on a wall if so desired. Interestingly enough, the RT2600ac has a pair of mounting holes on its underside that can be used to mount the router on a vertical surface. Around back, and from left to right, the RT2600ac has a power button, power port, a recessed reset button, a USB 2.0 port, WAN ports, and four LAN ports. One interesting detail about the WAN and LAN ports is that by populating both the WAN and first LAN port with cables coming from a modem, the RT2600ac can use both feeds to either load balance the connection or place them in an active/passive configuration. This allows the user, and assuming that connectivity is of paramount importance, to have dual ISP feeds into their home or office, and should one go down, the other will pick up immediately. Routing policy can also be setup within SRM to control what traffic goes where based on the source or destination address. As we said in our RT1900ac review, Synology’s SRM is hands down the star of the show. While performance is ultimately the most important set of metrics for any piece of hardware, if setup and administration is cumbersome, it not only slows down time to completion, but makes what might be a menial task unnecessarily difficult. Thankfully the user experience on Synology products has been stellar for years and the UI of the RT2600ac is no different. Like with the RT1900ac, setup is as simple as plugging in the router, connecting it to your modem, and bringing up your browser of choice. From there, it’s simply setting up your administrator account and SSID, and punching in your ISP information. It’s as simple as that. One feature that companies have been including in their firmware for years, has been to change the mode of operation of the router. When wireless AC first came out, I purchased a pair of identical ASUS AC66u routers so I could connect my upstairs and downstairs wired devices while taking advantage of the improved bandwidth provided by the new protocol. I did this by setting one to bridge mode. This is a feature that the RT2600ac inexplicably lacks. Companies work hard in product design to ensure features provide a quality experience to the end users that buy their hardware. Hardware that, like everything else, has a shelf life. When the consumer goes to update their device, it would be nice to have the ability to use their old device in ways they perhaps might not have intended. In my case, it would have been nice to retire the AC66u and replace it with the RT1900ac by setting it to bridge mode and linking together two separate environments in my house. While not a deal breaker, this feature would be nice to see in future updates. Anyone familiar with the Synology lineup of NAS boxes will also be familiar with its DSM, or DiskStation Manager OS. Designed to give a desktop feel from within a browser, DSM has made administering your NAS simple and intuitive. SRM is to the RT2600ac as DSM is to any Synology NAS capable of running v6.0 and above. Like DSM, SRM can be built upon by installing Synology provided apps though their Package Center. At time of publishing, there are eight apps in total that can be installed to provide additional functionality to the RT2600ac. A few are media centric, like Download Station and Media server, while others are network specific and feel at home on a router. Apps like Intrusion Prevention, DNS Server, VPN Plus Server, and RADIUS server, are no brainers for users that can use the functionality they provide. On my home network, I have run a VPN for years but never has the setup, from start to finish, been easier than with Synology’s new VPN Plus app. For testing, I downloaded and installed the app, and set it up in the router. It’s nice to have connectivity into my network from outside the firewall through applications like RDP, but for access to network devices without having to open up ports on my firewall, VPN Plus is a quick, reliable, and simple way to get a tunnel into the home network. Another app worth mentioning is intrusion protection. This app, designed to scan packets, can be setup to either alert when malicious packets are detected, or drop them entirely. It required USB storage to write logs to, and without storage, cannot even be installed. In our testing, a 4GB USB 3.0 thumb drive was installed directly into the side USB port on the router. Once in place, a notification popped up saying that it was being downgraded to USB 2.0 to reduce interference with the 2.5 GHz wireless band. When enabled, network performance across the board took a hit. A robocopy copy between servers was running and went from saturating the gigabit link between the two boxes, down to under 40 MBps. The settings can be tailored to only scan packets on the WAN port and by doing this, everything inside of the WAN returned to normal. This is something that should be kept in mind when considering using intrusion protection. With any complete suite of software, there needs to be mobile offers as well. This is a stance that Synology has long taken, and with the passage of time, its apps have been improved upon. With the latest DS Router app, available on both Google’s Play and Apple’s App Store, users have almost all the functionality of the web UI through SRM, but in the convenience of their mobile device’s screen. Parental controls can be made on the fly without having to sit down at the computer, and ports can be opened and shut with ease, all from the diminutive computer in their pockets. Testing the RT2600ac is a fairly straightforward process. We look at four separate metrics: LAN speed, 2.4 GHz speed, 5 GHz speed, and attached storage speed. For the attached storage tests, we tested both a USB 3.0 connected SSD drive and an SDXC card. The firmware that the RT2600ac is running throughout testing is SRM 1.1.4-6509 Update 3. To test the wireless speeds, we run file transfers both upstream and down between the desktop and notebook. Each test is run three times, with the average speed recorded. We do this from three different locations in the house. The first location is in the same room as the RT2600ac. The second is on the same floor, approximately 30 feet away. The third spot is on the opposite end of the house, on the bottom floor and approximately 60 feet away. For LAN speed test, we run those same file copies between our test desktop and a Synology NAS on the same network, both connected directly to the RT 2600ac. Finally, for the attached storage tests, the same copies are done, but from the desktop to the storage connected to the router itself. Much like the RT1900ac, we walk away from the RT2600ac impressed. As we’ve stated multiple times in the past, we like what Synology is doing with the UI on their NAS products and appreciate that its continued to take that experience and inject it into their line of AC routers. This isn’t just coming from this editor, Jamie and Ryan both have had plenty of positive things to say about the devices that Synology is bringing to market. The impact that Synology has had on the NAS market is great. While not the only vendor on the market that has incredible offerings for anyone needing network attached storage, it has been at the forefront of user experience. Synology’s work on the UI has been infectious, and over the years, other vendors have worked to better their UI, bringing the user experience up to the level of the performance of their hardware. The market is trending towards mesh networking, and as users at home decide to either upgrade their router, they are going to have more choices to make than simply going with a brand they trust. As the market shifts and consumers begin to look at varying technologies, I feel that conventional routers like this will only remain competitive through additional features, like those provided through the Synology Package Center. For anyone looking for a new router for their home or small office, they can do a lot worse. Home users should appreciate the quick and easy setup, fast speeds, and reliability of the RT2600ac. Small businesses might appreciate the ability to add redundancy to their internet connection, by taking advantage of the dual WAN load balancing plus failover feature of the router. Synology took the slightly better than average performance of the RT1900ac, learned what worked and what didn’t from that device, and improved upon it in every way. Performance is excellent, with my only real complaint that throughput drops off fairly quickly on the 5 GHz band the further you get from the router, but that’s more a limitation of the band itself, not the router. The RT2600ac is not only superior to Synology’s own RT1900ac, but most other offerings available in the 2600 AC class. At time of publish, Synology is offering a discount on both its RT1900ac and RT2600ac routers from a number of retails. You can read more about this here. The Synology RT2600ac earns an Editor’s Choice Award.